← JULY…Week Two: The Green Flies Are Coming! 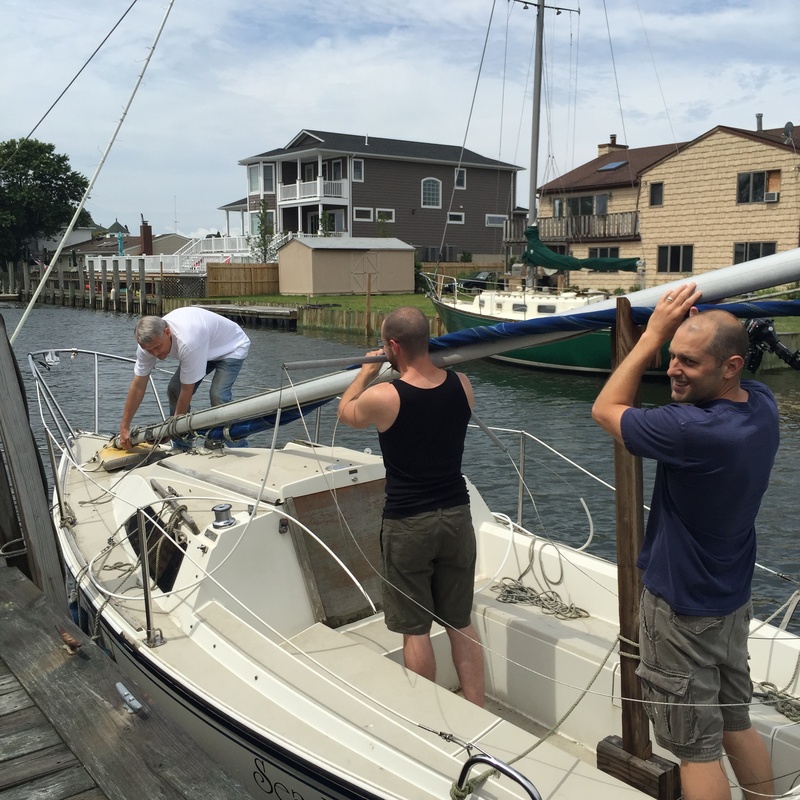 Yesterday the mast on our sailboat was raised. 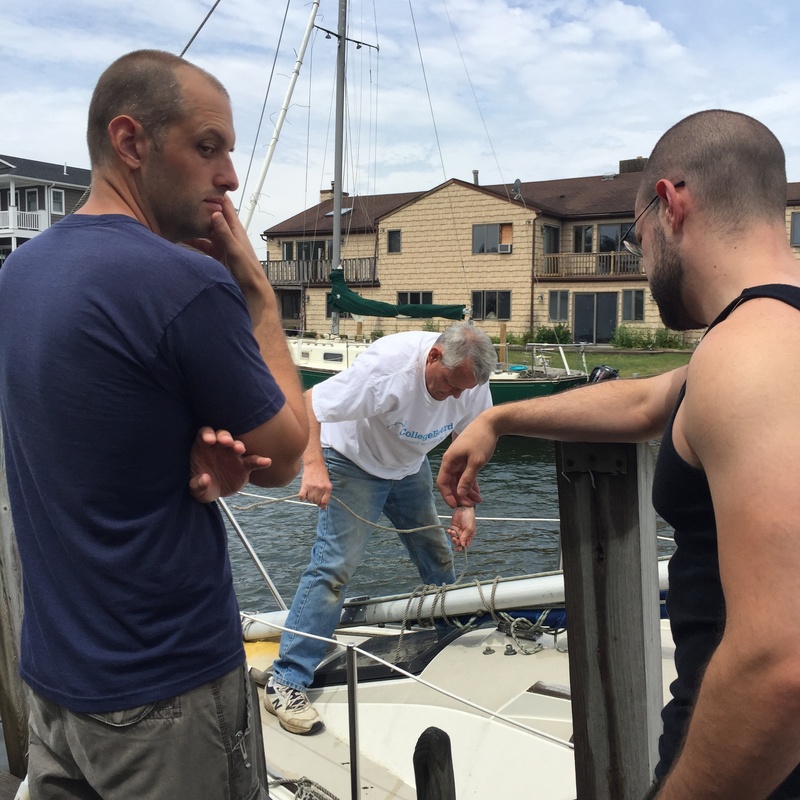 Even though my husband and the boys have done this annual task for several years now, they always need to stand around the dock for a while looking over the boat, touching things, winding ropes and discussing the procedure ahead. They are getting into the zone. Contemplation and consultation between the mates. “Should we offer up a better way of doing things?” the mates whisper among themselves. The captain is eager to begin and jumps aboard. One of my sons will start the discussion with…Maybe we should try something different this year…I have an idea…But they are always shot down by my husband. They may be grown men now, but out there on the dock, they are all deck hands of equal rank and their father is “The Captain.” In the end, they will follow his directions. 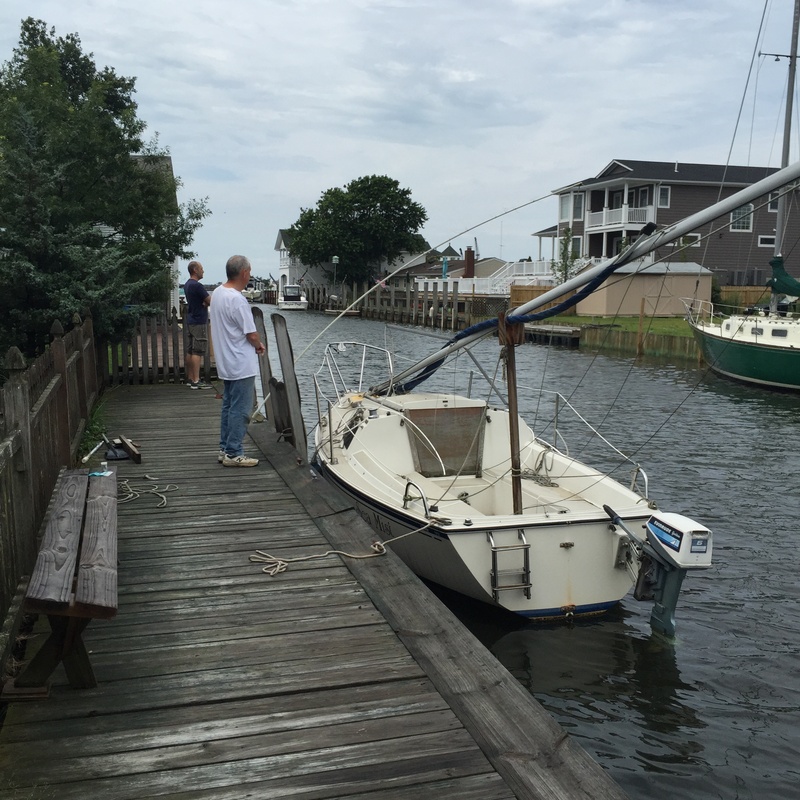 It has always been that way, when we go boating, and more so now that we have a sailboat. My husband has been motor boating for over 50 years, so I concede authority to him on the water. 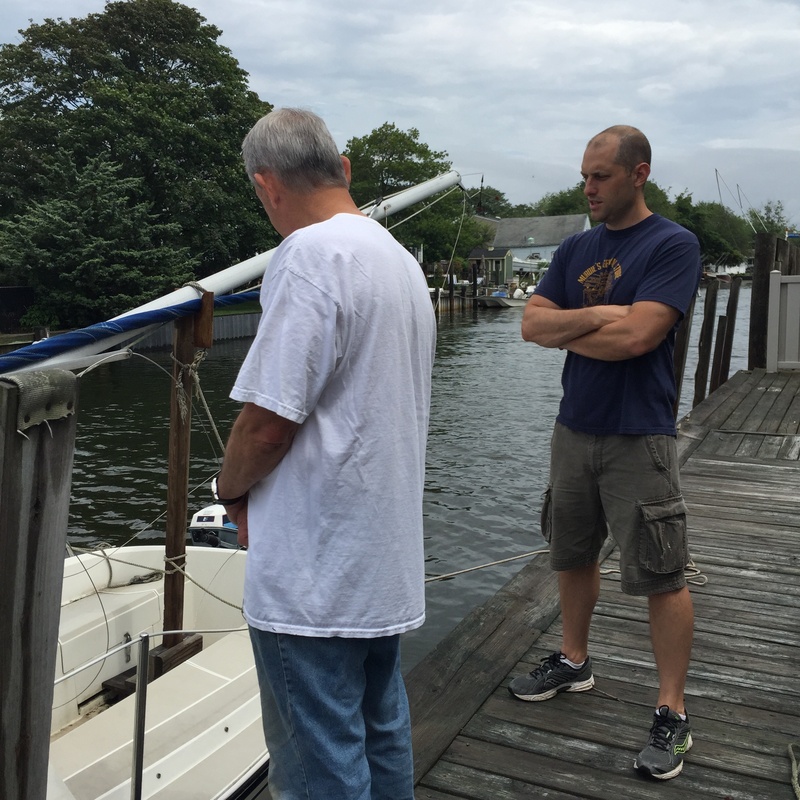 I admit I know nothing about boats, engines, rules of the waterway, and, definitely, not sailing. It’s the time and place in our lives when I say Aye, aye, captain! and really mean it. 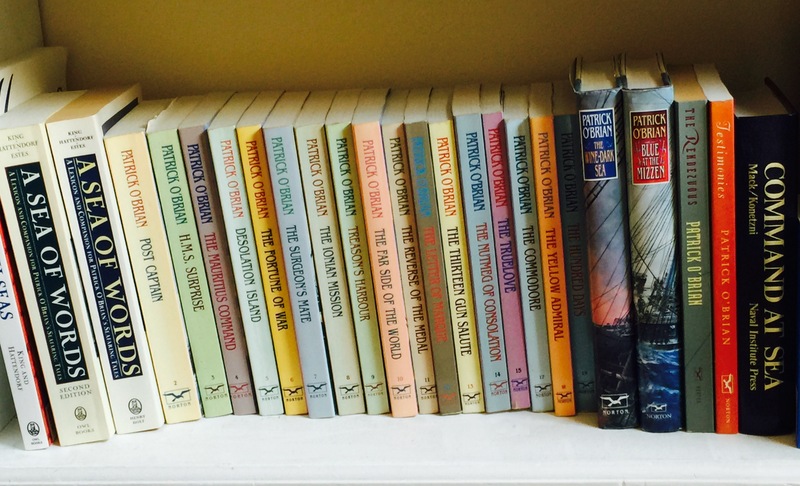 This shift in interest from motor boating to sailing coincided with his reading of the Patrick O’Brian novels. For those of you who are unfamiliar with this author, O’Brian wrote a series of twenty novels that were set in the Royal Navy during the Napoleonic Wars. The first book in the series is called Master and Commander (Remember the movie? I fell asleep in the first 15 minutes.) 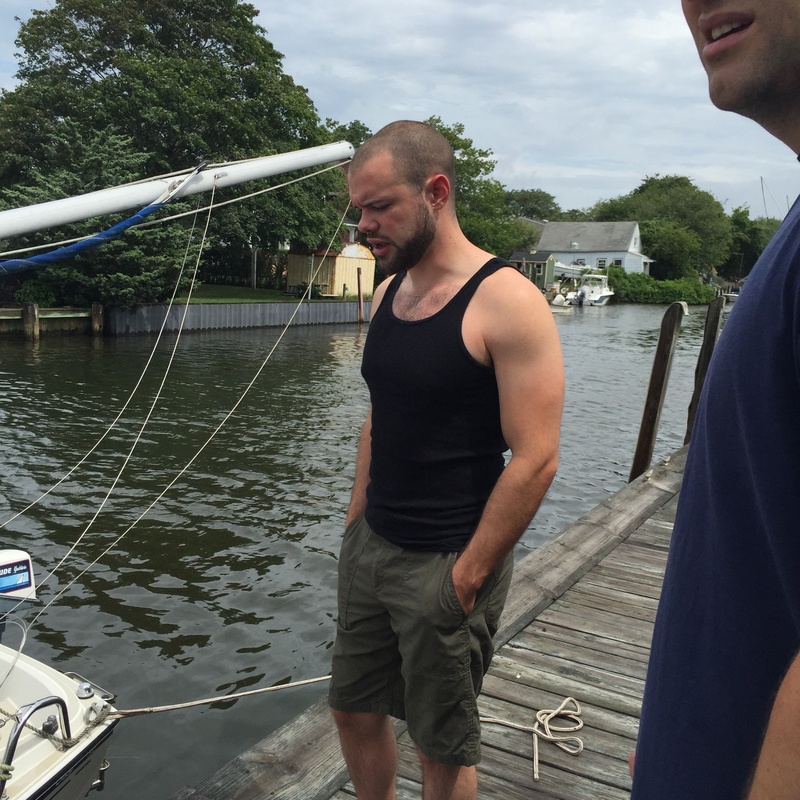 My husband began fervently searching for an affordable sailboat around the same time he finished reading those books. In addition to the O’Brian novels, he studied instructional sailing books and left them out on the coffee table, probably hoping I would pick them up and ride on the comet of his enthusiasm. After we bought the sailboat, I began reading those instructional books when he wasn’t around. 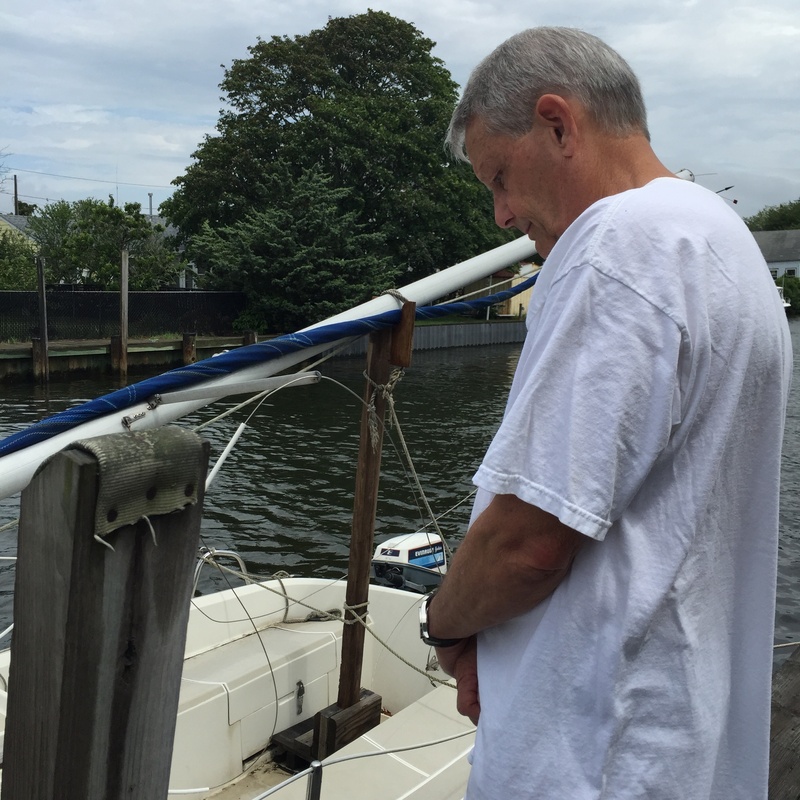 My secret plan was to become a self-taught sailor and surprise him with my expertise on our first shakedown cruise. Instead, I found that, within a few minutes of opening the manuals, I developed a pounding headache and sensations of nausea – a prophetic sign of what was to come. What I deciphered from those books was that operating a sailboat was much more complicated than turning the key in a motor boat and pushing the throttle into “forward.” I gave up; I had no desire to memorize any of the hundreds of nautical terms nor did I care to learn the physical skills required to man a sailboat. My idea of a relaxing day out on the water didn’t involve “manning” anything except my personal seat cushion on the boat. I wanted the quickest route to the beach so I could put my towel down in the sand, munch on pretzels, read a little, and then take a nap. He made it sound so exciting, I couldn’t wait to feel the wind and the salt spray blowing through my hair. 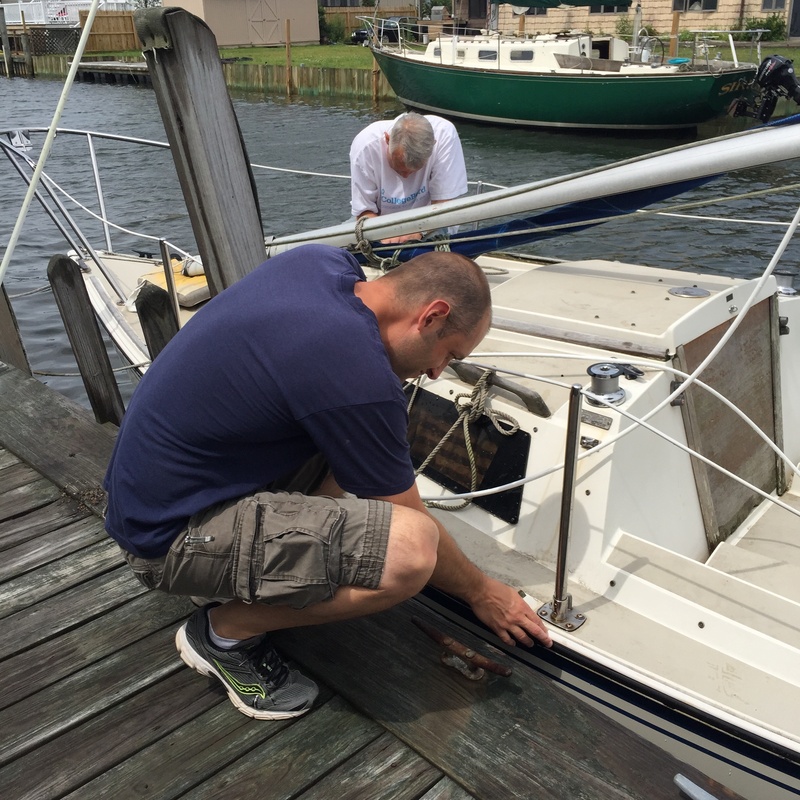 After the first few outings in our sailboat, I decided that sailing was not for me. There were times on a hot summer day when you were near fainting because there was no wind, and even the flotsam in the water moved faster than you. Then a speedboat would blow by and create the only wind of the day, along with a wake that bobbed the sailboat up and down and side to side – creating an instant migraine headache and nausea I hadn’t known since my first pregnancy. Then, there were other times when the wind picked up unexpectedly and all hell broke loose, along with the sails and some of the lines, and I would scream, Where are the life jackets?! It was too much work. Since I didn’t study the sailing manual, nor had I read any of those seafaring O’Brian novels, I was helpless as a first mate. I just stared blankly at the captain when he called out commands. I didn’t know the difference between starboard, aft, stern, bow, port, abeam, abaft or astern. He was speaking a foreign language and, with the boat keeling over and sails billowing out, there wasn’t time to check my i-phone for the nautical translation. 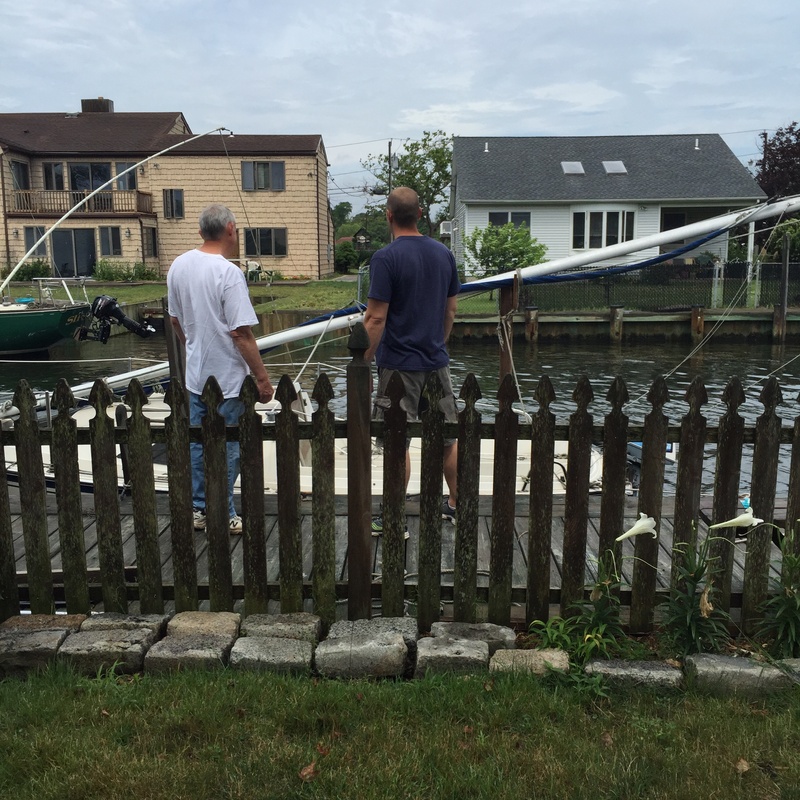 That left my husband working all the ropes (they’re called “sheets” on the sailboat), adjusting the jib and the mainsail by himself, and ducking his head under the boom while calling out: Coming about! Hard-a-lee! while I was shouting back What does that mean? What are we doing? Should I move to the other side of the boat now? Why are we tipping over so far?! 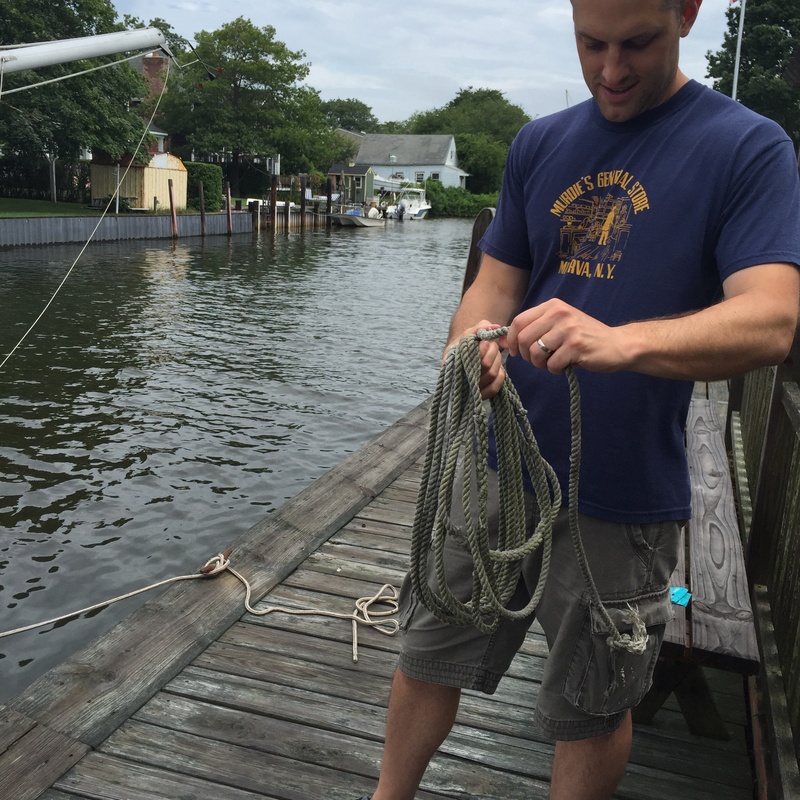 For brevity’s sake, I direct you to this website to get a sense of the magnitude of terms and the knowledge needed to earn the title of “Captain” on a sailboat. One day, while we were calmly sailing on summer winds, I closed my eyes and dozed for a few moments, only to awaken to the disconcerting look on my captain’s face. “Look at those strings attached to the top of the mast,” he tells me. “Just point the front of the boat at that tall house on the horizon!” he calls back to me, as he climbs along the side of the boat, but I don’t know how to ‘man the tiller’ or the engine, so the boat flops in one direction, then another. As I try to correct the course I feel my stomach lurching up to my throat. My husband slips and almost falls into the water, grabbing the stay and dangling off the edge. “Don’t you dare fall off this boat!” I yell. “I won’t know how to get you back in.” And that’s the truth. I won’t know how to circle back to pick him up. I don’t know how to restart the engine or stop the sails from flapping or the boom from flying around. The best I could do is throw him my seat cushion to use as a makeshift flotation device, tuck my head into my lap to avoid being clobbered by the boom, and then start screaming. Screaming – it’s the only skill I’ve picked up from this relaxing sport of sailing. This entry was posted in Uncategorized and tagged keeling over, Patrick O'Brian, Raising the mast, sailboats, sailing, sailing terminology. Bookmark the permalink. 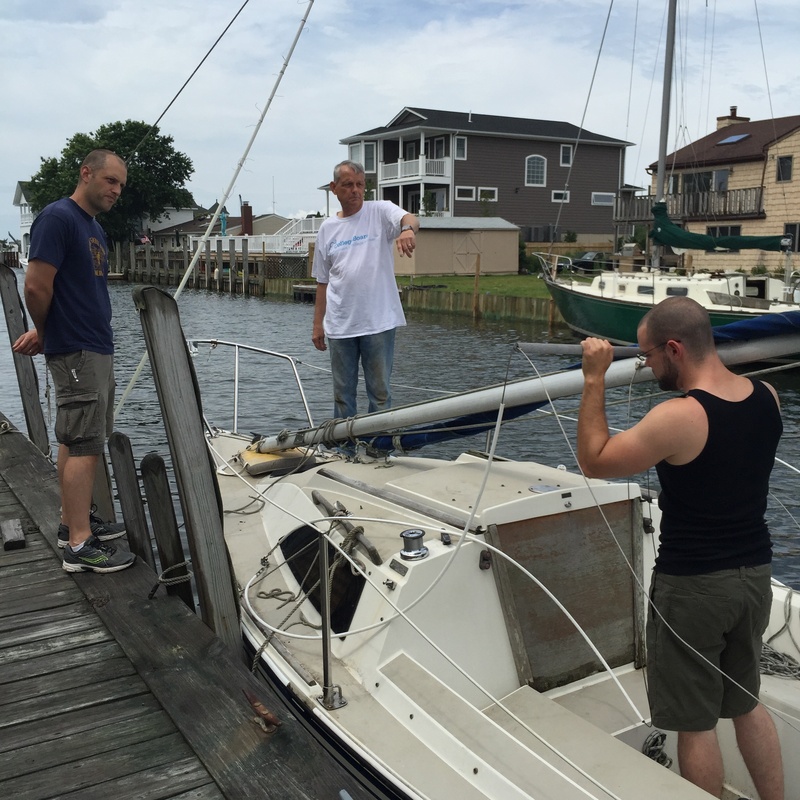 8 Responses to JULY…Week Three: Raising The Mast! Hilarious and true. I actually think this could be a longer piece. Perhaps a short memoir? Thanks, Sue! Love your paintings!! You have described sailing to a T and your story brought back some hilarious memories of my own sailing days!